When you want a custom chrome look without drilling or expensive modifications, choose Putco chrome taillight covers. Putco chrome taillight covers install on your truck in seconds. Made from durable, chrome-plated ABS plastic, these door handle overlays add a distinctly custom look to your truck. 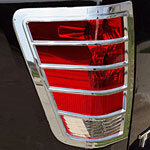 Putco chrome taillight covers are custom fit for your truck's specific make and model.